We're excited about making the workflow of bat call data analysis even more efficient with the new, extended BATscreen 2.0. The results of an automated call analysis, which was developed in the research project RENEBAT III, can now be imported directly in BATscreen 2.0 and are presented as bat categorization proposals. 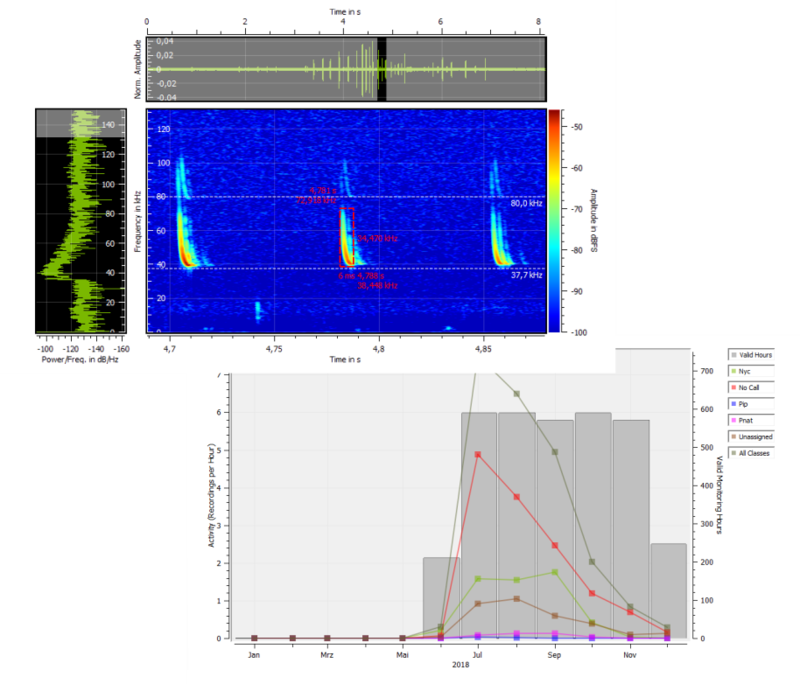 This allows for a fast and efficiently evaluation of even large amounts of bat call data, that typically results from long term bat monitorings on wind turbines. The advanced visual analysis tools combined with the audio playback allow the user to reliably verify the categorization suggestions of the automated analysis and save the results directly in the call file headers. But not only individual call files can be analyzed. With the evaluation plots for whole data sets, temporal activity distributions as well as class events can be determined and correlations to environmental influences, such as temperature, precipitation and wind speed, can be identified. To use the results of the data analysis to calculate turbine shutdown times, for example with the software tool ProBat, or in general to create your report, BATscreen 2.0 offers a wide variety of export options. With just a few clicks you can create ProBat-specific export files or provide the calculated plots as vector and pixel graphics. If you prefer to create your own styled plots, all data can also be provided as raw data for further processing, for example with Microsoft Excel®. A limited free BATscreen LITE version is now available in our download area. To take advantage of the full functionality, please purchase BATscreen PRO. If you already own a license for BATscreen PRO, you can upgrade to the latest version for free.